The Digital Devices MAX S8 is a tuner card with 8 HDTV tuners on a single card with PCIe connector. 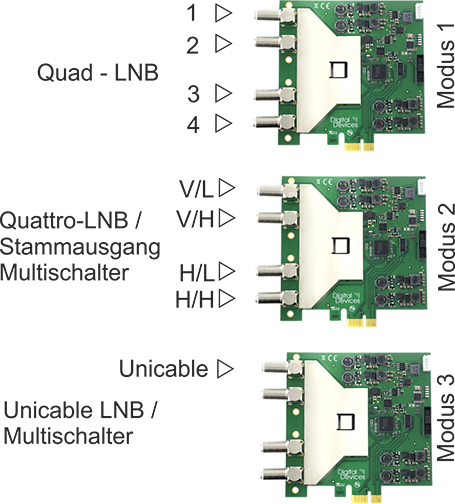 The high density of the design and the choice to select the operating mode as well as Unicable ® and JESS ® support and only 5 Watts power consumption make the card ideal and flexible for many DVB-S2 applications. The card can be used with Windows XP, Windows Vista, Windows 7, 8, 10 and Linux operating systems. The operating modes are „Quad“ or „Unicable“. Using the “Quad” mode the card can either be connected to a LNB or a 4x multi switch. It supports one satellite. In Unicable mode it requires only one coax cable to support 8 tuners using Unicable ®. Using JESS ® it can be connected to up to 32 tuners with just one coax cable.